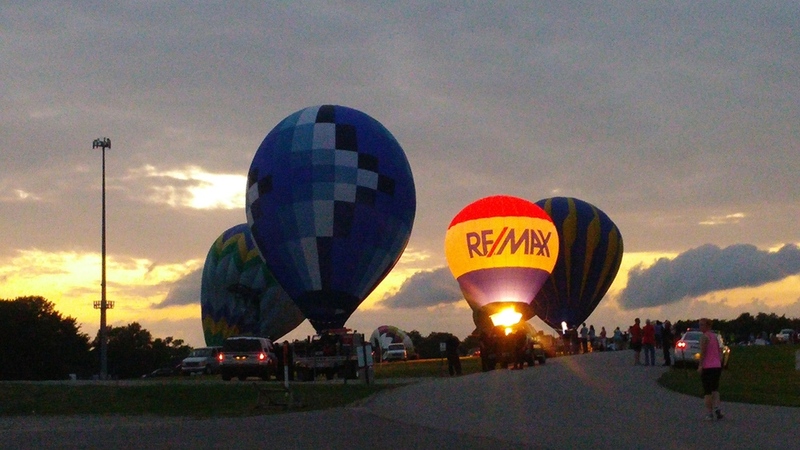 The Balloon Fest started at the Thompson Airfield in 2011, and due to the popularity of the event it moved onto the First Monday Grounds in Canton, Texas. The Canton Texas Visitor Bureau now hosts this two day annual event each May. The festival has grown and now includes vendors of all kinds, great food and art vendors showing off their pieces. Family fun activities are abundant with pony rides, bounce houses, climbing wall, car show and the very popular 5K glow run on Friday night. Each year the festival highlights great East Texas Music with a Battle of the Bands competition on Saturday and the event opens on Friday night each year with live music, Balloon Glow and all the vendors. The half marathon is Saturday morning and runners from all over come to compete in this officially sanctioned timed event. Let’s talk balloons. The stars of the show are all the wonderful Balloons. Not only do they take off each night in a wonderful display of color they are competing in a sanctioned competition by the Balloon Federation of America each morning. The event does have tethered rides (during event) and full Balloon rides (reserved in advance) so make sure to save the 3rd weekend in May each year and enjoy this fantastic festival. 9:15 PM on Friday, May 17th the 5k course will run around and through the First Monday Grounds. This is an after dark 5k that will run through "glow stations." Bring your glow stuff, or buy some from us. The run is completely free, but we will have t-shirts for sale. Show off your pride and joy, or check all the cool cars out. RG Car Show Productions will host this years car show. It will be on Saturday the 18th. Registration begins at 2:00 PM. There will be live entertainment Friday afternoon May 17th with a performance by the winners of last year’s Battle of the Bands, Finding Shade. Saturday will have music throughout the day. Following the Balloon Glow, we are excited to announce the Wesley Pruitt Band will be performing! Balloon glows on Friday and Saturday at 8:00 PM (weather permitting). Feel the intense heat as the flames shoot into the night sky and light up the balloons during the balloon glow. It is a truly spectacular event and is a site to behold. If the weather is too intense to inflate the balloons, we may have to resort to a candlestick burn also known as a oilfield burn, which is equally impressive. You will not be disappointed to see the flames shoot up to 30 feet in the air and light up the night sky. Live performances on Friday and Saturday! An awesome performance by last year’s Battle of the Bands winner, Finding Shade! Live music throughout the festival with the great Wesley Pruitt Band headlining after the Balloon Glow!